﻿﻿Your baby's comfort is important during breastfeeding. 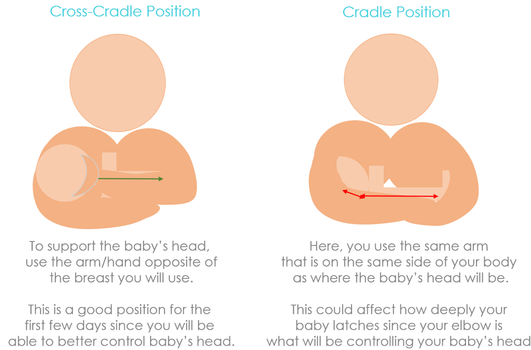 Just like we like to eat our food with good ergonomic positioning, this is also important to babies. For example, when we drink from a cup, we tilt our heads back some to prepare for swallowing. Also, when we eat or drink, we (whether consciously or not), ensure that our necks and spine are are aligned-it would be hard to drink from a cup with a crooked neck. It's important to understand that newborns feel pain, and that likely the positioning they were in in-utero may determine what positions are comfortable for them after birth, too, which can impact how long a baby can last in an uncomfortable position while on the breast. TIP: It might be a good idea to nurse in front of a mirror during your early breastfeeding days so that you're able to see your positioning and your baby's. Full-length mirrors are sold for little cost at many retail stores, and these can be used to stand or lean near a mother's nursing "nest". Learning to breastfeed takes practice, just like dancing. Latching is one "step" of the breastfeeding dance, and it's best learned by observation and practice--just like when you learn dance moves.